Legend has it that on their wedding night Napoleon refused to allow Fortune to sleep with them in their bed, whereupon Fortune presumedly bit Napoleon's leg. Josephine replied that "If the Pug doesn't sleep in our bed neither do I!" From then on Napoleon was condemned to share his bed with his wife AND her Pug. Dog Painting 1840-1940. A social history of the dog in art by William Secord. An entire series of porcelain pug figurines was created by the German sculptor, Johann Joachim Kaendler, Modelmeister of the famous Meissen porcelain factory in Germany, to serve as secret emblems for the German underground Freemason lodge know as the "Lodge of the Order of the Pug". They declared themselves the "Mopsorder" and chose the pug as a symbol of loyalty, dependability and everlasting commitment. A Pug named Frank appeared in the popular movies Men in Black and Men in Black II. Celebrities such as Maura Tierney, Carol Kane, and Tori Spelling have appeared in TV and print ads with their Pugs. A Pug was also one of the stars of the movie The Adventures of Milo and Otis. 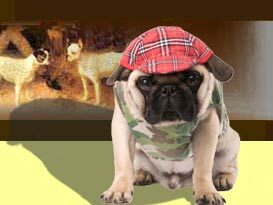 More about famous pugs. 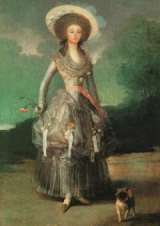 In his portrait of the Marquesa de Pontejos of 1786, the Spanish painter Francisco Goya represented a fawn pug in the foreground. Oil painting by Richand Ramsey Reinagle. 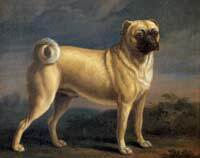 In paintings and engravings of the 18th and 19th centuries pugs usually appear with longer legs and noses and cropped ears. The 'modern' look probably appeared after 1860 when a new wave of pugs were imported from China. These pugs had shorter legs and the now-familiar "pug nose". Ear-cropping was not outlawed until 1895. One of the earliest known representations of a pug in the Western World is a little fawn pug in a French painting entitled "Louis XIV and His Heirs", painted around 1714. A painting entitled " Un Carlin" and commissioned by Louis XV in 1730 was one of the first works in Europe to have a pug as the main subject. 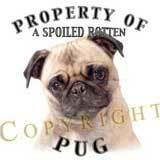 "Property of a Spoiled Rotten Pug"
A nice website for Pug lovers, where they can find everything related to pugs: pug history and origins, pug colors, pug stuff, pug health tips and much more.